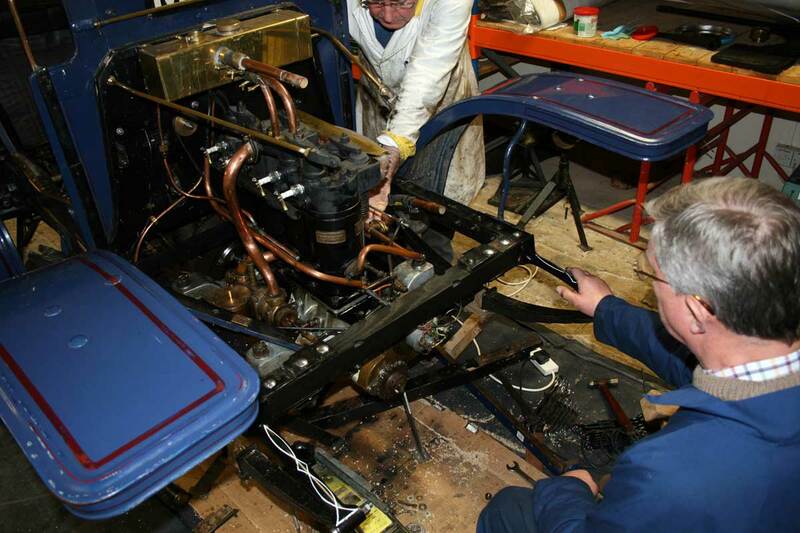 During the winter of 2012/13 the car has been taken off the road for its annual maintenance schedule. This has enabled certain other suspect items to be examined in detail, and repaired/replaced as necessary. 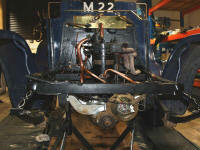 Front suspension strip down at end of December revealed wear on king pins, spring shackle bolts and spring eyes. These parts now remade and fitted. Wear eliminated. Whilst removing the beam axle we came across decayed timber and a crack in front cross chassis member which is now replaced with new ash replica made by Andrew Curtis. Matured seasoned ash heartwood that is machined to fit. This has stiffened the whole front end and created a much more solid motor car. Worn coach bolts replaced with new. Front spring shackles and shackle pins: the spring shackles were bolted directly through the spring eyes with no bushes and those eyes were worn hopelessly out of round. Geoff Luck of Beeston has machined them to true (tempered spring steel!) 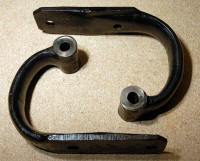 and hand made replacement oversize shackle pins (six). Absolutely superb work which has returned the spring position and settings to 'as new'. No side movement and very firm. This has added to the rigidity brought about by the replacement cross member. Steering parts, king pins, bushes and lower ball races: remade to original dimensions by Group Precision Engineering of North Walsham. The lower ball races made in special D2 steel and sent away to be case hardened in the Midlands. Again, superb work that is restoring the steering to 'as new'. Ken Hilton and Pete Wilgoss have stripped and rebuilt the quadrant steering box and eliminated the play that was evident. 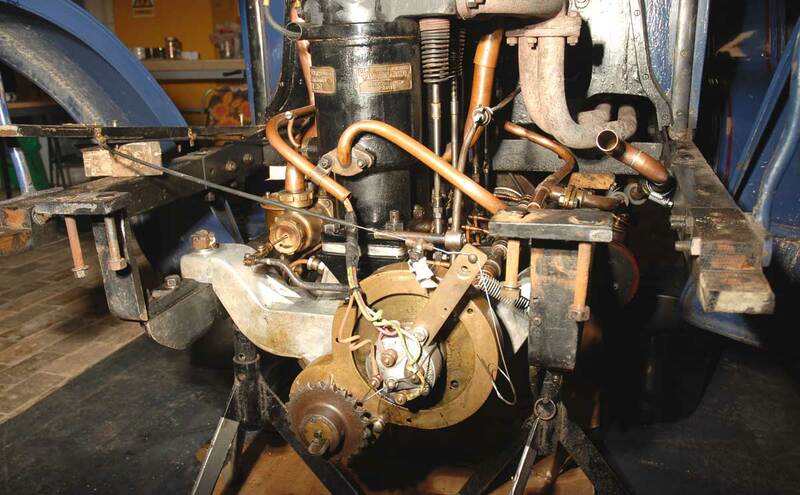 Again very good work and all this restoration will add to the precision of the steering. 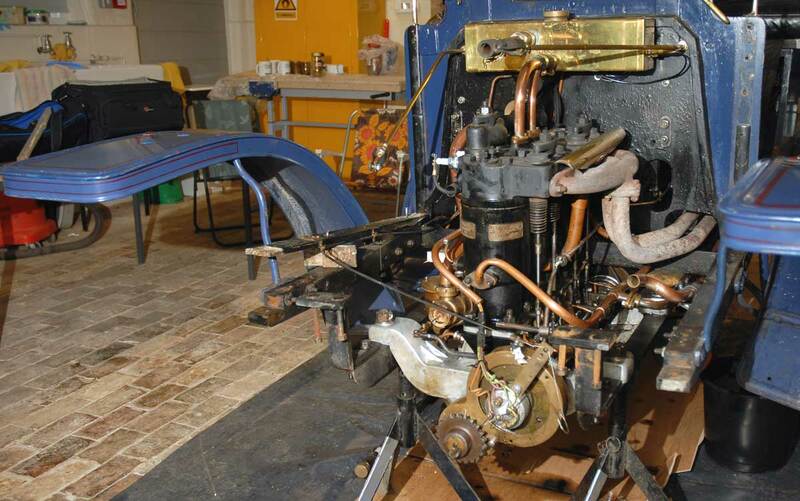 The team have so far spent a total of just under 180 hours on this overhaul which is not bad considering the demands of the work and very slow pace because of the need to feel our way with each job and the great care needed for each operation. The museum, through Vanessa, Ruth and Robin have come up trumps with the finance. To date the costs of making replacement parts have reached just over £800 and we received the invoices yesterday and Martin Lawrence had processed them and arranged payment by 3.00 p.m. This brilliant support adds to the team confidence and makes us realise just how supportive the administration is. Best of all it makes us feel appreciated as part of the larger museum team. Overhaul notes March 31st March 2013. 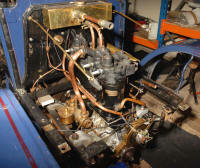 Because of a blockage behind the impellor it was necessary to strip the water pump and remove the shaft. 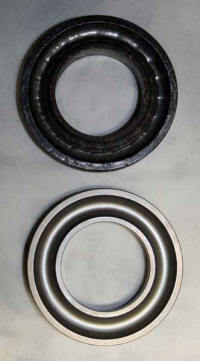 Heavy wear was found at the drive end where it passed through the plain DU bearing. The shaft was not stainless but EN24 and the DU bearing bush of steel backed bronze. A new shaft was made of 10mm BN3 which was case hardened where it runs through the impellor bearing to prevent wear at that end. The pump body was bored out to 19mm at the drive end and the plain DU bearing replaced with two sealed ball races of 10mm internal dia. 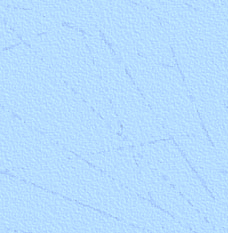 and 19mm external X 5mm width. Whole reassembled with the shaft dabbed onto the bearing centres with Loctite. 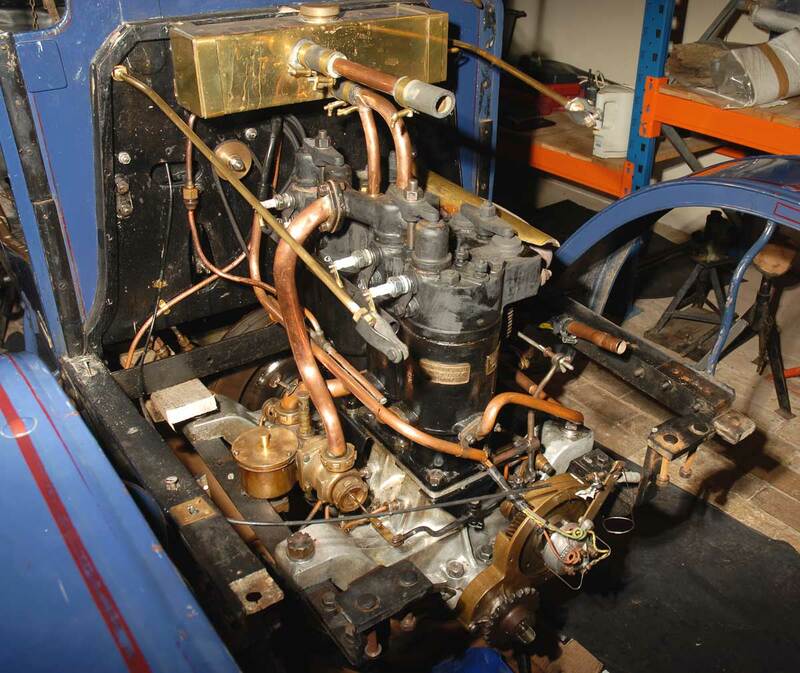 The radiator and all front panelling has been removed, as the body mounts need to be refurbished. 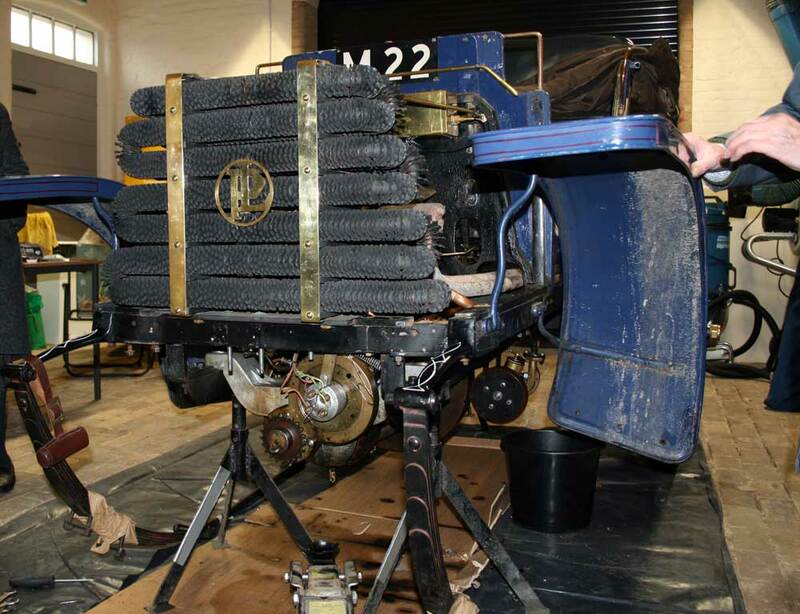 This has given us the opportunity to display the engine in more detail. 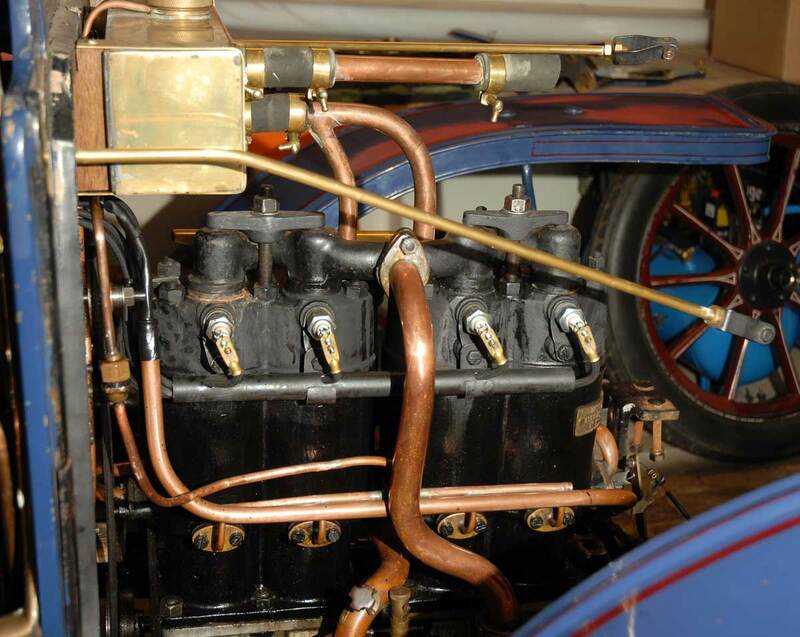 Right hand side of engine, showing the spark plugs. Front view, showing distributor and also front suspension mounting locations. 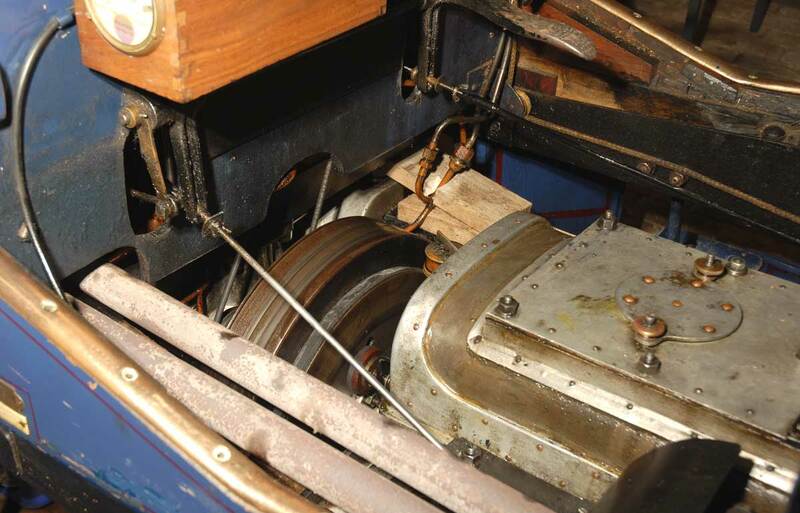 Interior view, showing flywheel (left) and top of gearbox. 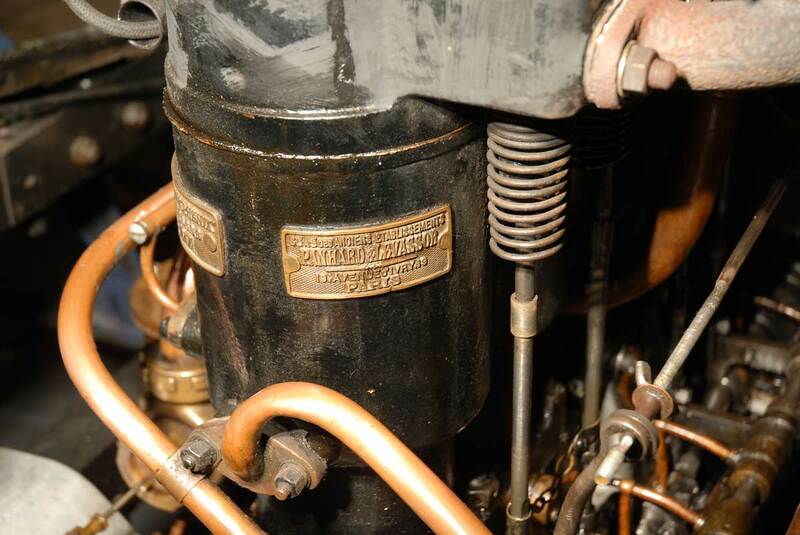 Front engine cylinder, with manufacturer's plate. Note the ovality of the mounting hole in the top bracket, caused by wear over the years. 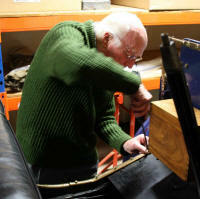 Chief Engineer Ken Hilton hard at work. 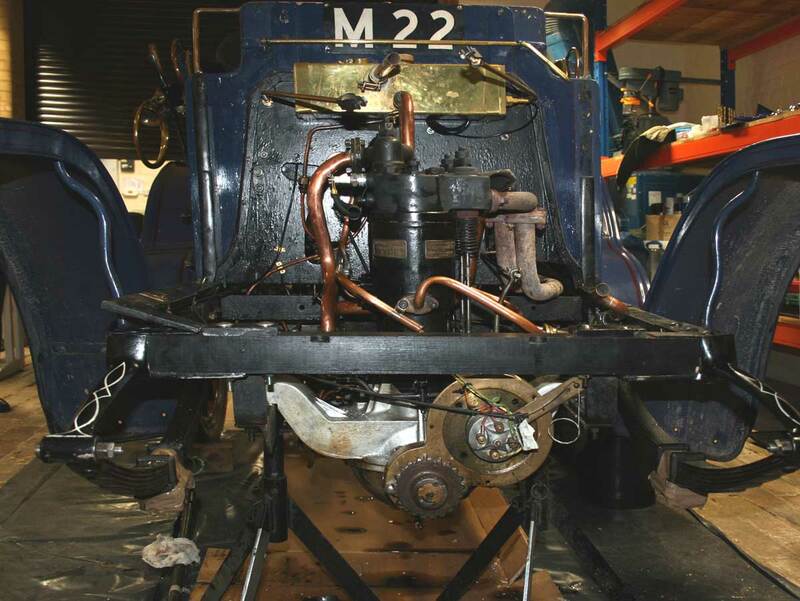 The car supported on axles stands, whilst the front suspension components are removed for renovation and replacement. Working on the front suspension. With the car up on axle stands and the wheels, suspension and front panels removed, the detail of the front end and out new radiator can be examined. 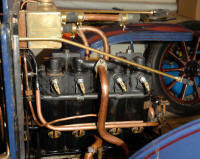 Phil Waltham, Team Panhard, February 2013.